Six women took up the vigil for Julian Assange outside the Ecuadorian Embassy for several hours on Sunday morning and across lunchtime, most from UK Friends of WikiLeaks (UK FoWL). UK FoWL has been collecting messages of solidarity for Julian for several weeks. These had been bound into a book. Read all the messages here. 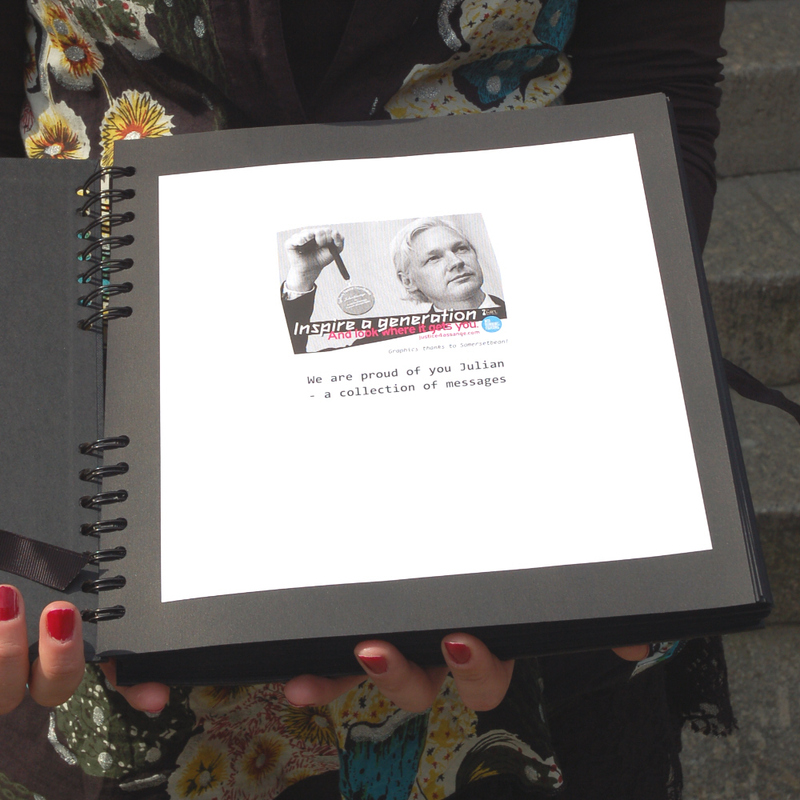 As there was no one on the Embassy front desk to receive the gift, Sarah Harrison of WikiLeaks took it in to Julian, emerging shortly afterwards to pass on his thanks and, cryptically, a bag of lollipops. Since July 28th supporters of Julian Assange and WikiLeaks have been sending in their messages of support for Julian – reminding him they are there, letting him know the ways they have been standing in solidarity with him and offering words of thanks for all that he is doing. 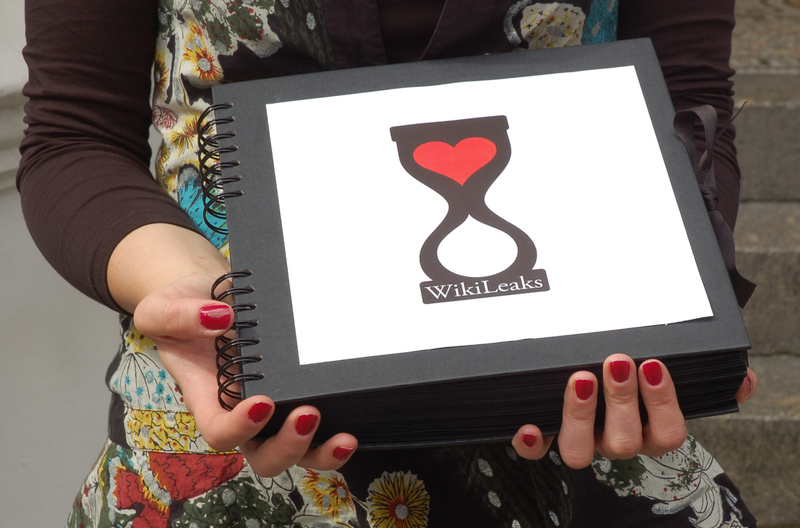 The project was initiated not just to let Julian know we are proud of his work but to remind the world that there are many of us investing time, energy and commitment in supporting WikiLeaks; we see that the world needs changing, that it can be changed and that WikiLeaks is a valuable mechanism for achieving this. 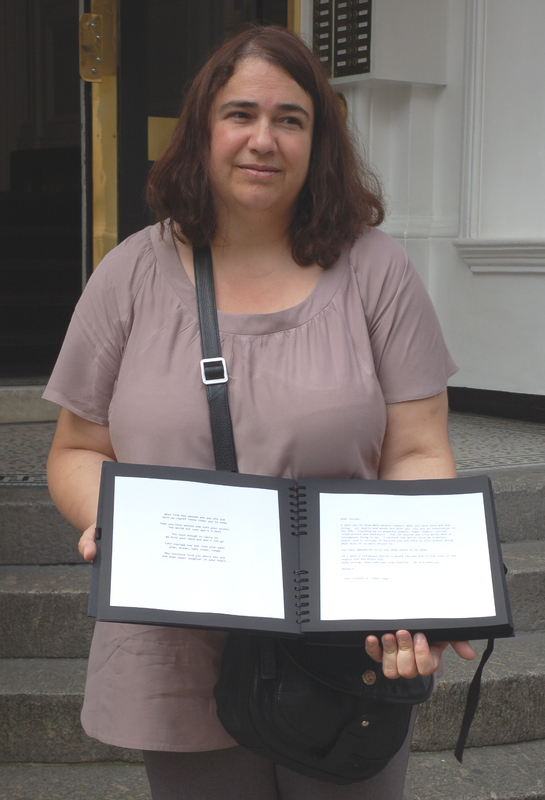 Messages sent in by supporters have been posted at support-julian-assange.com (filed under messages of support) and have been bound into a book and hand-delivered to the Ecuador Embassy where Julian continues in his plea for political asylum. We understand that Julian is very appreciative. WikiLeaks certainly have some wonderful friends. Thanks to UK, Scotland and Frankfurt FoWL for initiating and coordinating the project, also to somersetbean for awesome graphics! One of us stayed on at the Embassy and four of us headed into Hyde Park with Olympic themed flyers to hand out to the crowds converging on the Olympic screens and for the later concert. Getting on for 1,000 flyers were given out before we left. As London welcomes the world during the 2012 Olympics we welcome you in joining us as we stand in solidarity for the freedoms WikiLeaks are fighting for. See also this report and the last batch of solidarity messages. Gallery | This entry was posted in Assange, Reports and tagged Britain, flyer, Friends of WikiLeaks, Julian Assange, leafleting, letters, London, solidarity, WikiLeaks. Bookmark the permalink. Animo, Julián!!! El Ecuador te espera con los brazos abiertos!!! Translation: Courage Julian!!! Ecuador awaits you with open arms!!! 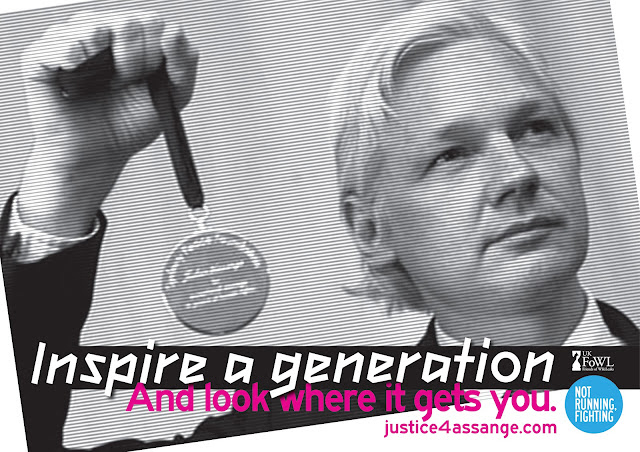 Support for Julian Assange! Free Julian Assange now!